A trade delegation of nearly 70 Arizona business and political leaders visited Mexico last week to discuss handling the NAFTA renegotiation. Efforts to modernize the North American Free Trade Agreement (NAFTA) are officially under way. Considering that Mexico is Arizona’s No. 1 trading partner, accounting for more than $8 billion (about 30 percent) of all Arizona’s exports to foreign markets, it is vital that any modernization of NAFTA protects this relationship. A trade delegation of nearly 70 Arizona business and political leaders, including Greater Phoenix Chamber VP of Public Affairs Mike Huckins, visited Mexico last week to discuss and ideally protect the sanctity of the trade agreement between Arizona (and the U.S.) and Mexico. The effort was widely recognized as the largest trade mission ever from Arizona to Mexico, and likely one of the largest ever in the nation. Legislators and business leaders on the trip encourage our federal officials to work cooperatively to expand the trade agreement and make it more beneficial to those involved, while also building a foundation for the future. The trade delegation co-chaired by Arizona state Representatives Tony Rivero (R) and Rosanna Gabaldon (D) spent five days in Mexico meeting with federal leaders in Mexico City before heading to the State of Guanajuato for meetings with its legislature and governor. The Arizona delegation and Mexican officials both hold NAFTA in high regard and noted that without it, the trade position between our two countries would not be weakened. 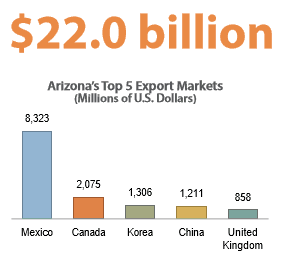 It is significant to note that our NAFTA trade relationship also includes Canada, which accounted for $2.1 billion in Arizona exports in 2016. Trade officials from the United States, Mexico and Canada have released an aggressive schedule of NAFTA renegotiation meetings. They will reconvene Sept. 1-5 in Mexico and then later that month in Canada, to be followed by another round in Washington in October. The rapid meetings are likely the result of the jeopardy NAFTA faces after President Trump stated he may eliminate the trade agreement or alter it significantly.